So you may be wondering what to get your teenage son for his birthday this year? Well if he is a Hockey Fan why not go for the Stanley Cup Birthday Cupcakes! Yes each individual Stanley Cup is edible and silver. The hockey sticks are edible too, although we can’t reveal the secret to making them 🙂 We hope you enjoyed taking a peek at one of our customers picks for her son Demitri’s Birthday! 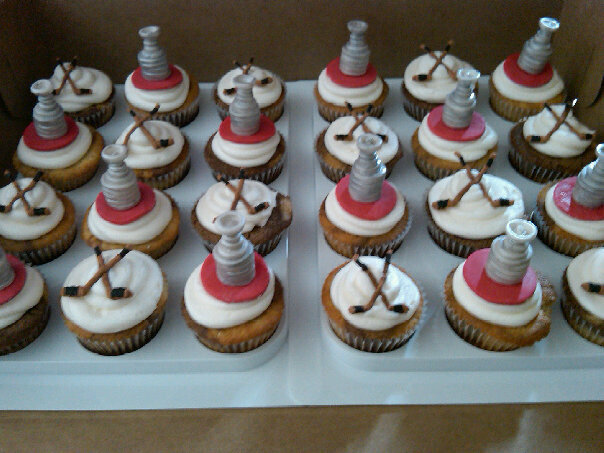 Stanley Cup Cupcakes by Bear Heart Baking Co! Pink and Champagne Wedding Ideas! Love this color scheme for an elegant wedding! Keep Reading for our Cupcake Delivery this weekend to a Champagne, Pink, and Black Wedding! 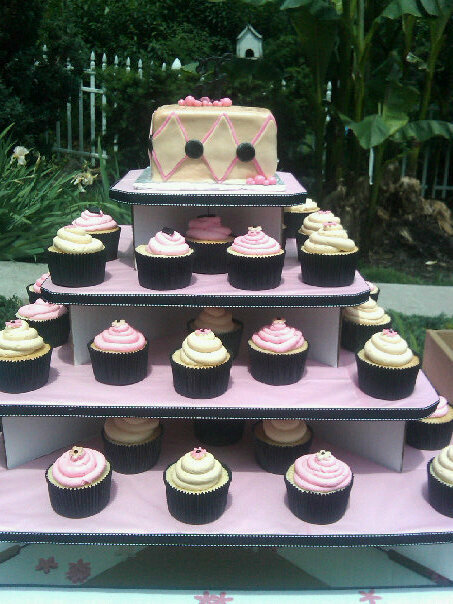 Pink, Champagne, and Black Wedding Cupcakes tiered! We made our first Wedding Cupcakes this weekend! 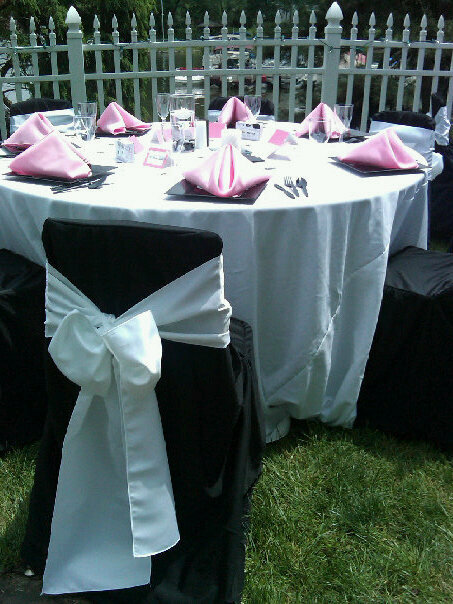 The bride’s Wedding colors were Pink, Champagne, and Black! She wanted a square cake on top for her and her husband to cut into. Also a first were the jumbo cupcakes cascading down the tiers! 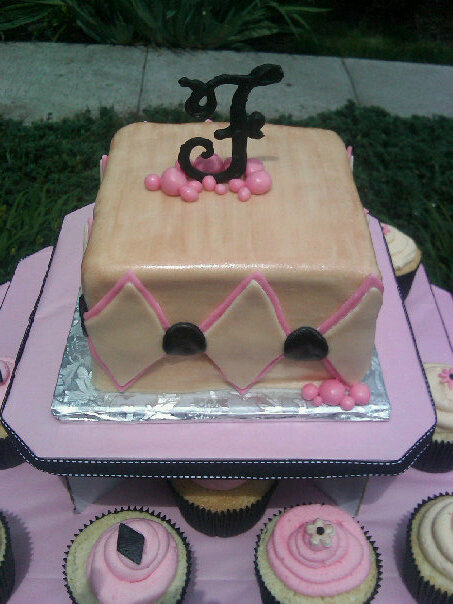 A big “F” for Fritsch on the top made out of Royal Icing topped the Wedding Cupcakes off perfectly! Fancy F on top of the Wedding Cupcake tier! The Argyle pattern around the cake was also repeated throughout the tiers with a small Black Diamond on top of the Jumbo Cupcakes! Small Champagne flowers and and pink flowers topped the remaining Jumbo Cupcakes. 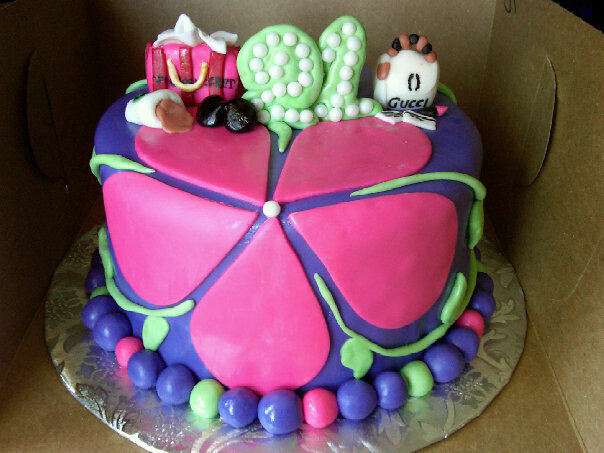 The small Bubble detail at the top of the cake was symbolic of Champagne. Adding a subtle touch to the top of the tier. The cupcakes were delivered this past Saturday to a home in Lake Meade which doubled as the gorgeous setting for the Fritsch Wedding. I even took some photos for brides looking for inspiration! Love the huge Bow on the back of the chair! Outdoor Wedding at Lake Meade! Hope For Cope Basket Bingo Donation Daisy and Tulip Sugar Cookies! 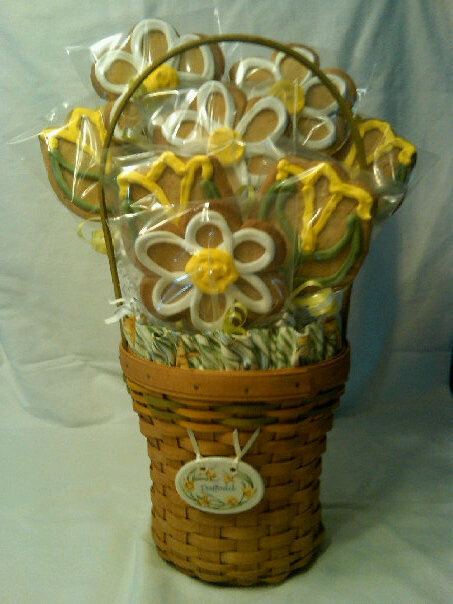 Our Bakery just finished decorating 4 Daisy and 4 Tulip Sugar Cookies for the Hope for Cope Basket Bingo this Saturday! We were approached by a good friend Valerie about some kind of donation for a Basket Bingo benefiting Jazmine Rae Cope and her fight to beat AML Leukemia…Hope for Cope. The Longaberger Basket was donated for us to use and fill with Edible Flowers (sugar cookies to be exact) The tulips and Daisies went perfectly with the colors on the Longaberger Daffodil Basket liner. Yellow and Green were the perfect combination! We wrapped each cookie individually and stuck them into the basket. They are all set for the Basket Bingo on Saturday May 29th 2010! We are so happy to be a small part of supporting Jazmine! Help Jazmine by having hope. Jazmine Rae Cope is a 13 year old 8th grader at Spring Grove Middle School that was diagnosed on February 20, 2010 with AML Leukemia and Myelofibrosis. She will be undergoing aggressive chemotherapy followed by a bone marrow transplant in the next few months. We hope that you will help support Jazmine too! Hope For Cope! So on Saturday we are doing our first tiered Wedding Cupcake order! 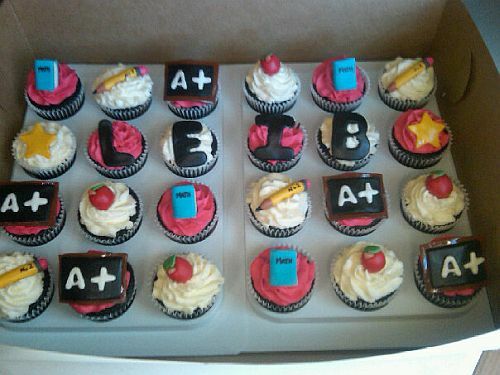 Super Excited for these cupcakes. 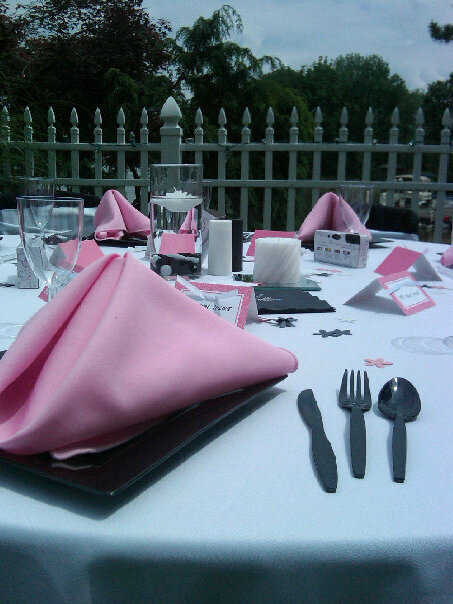 The bride has chosen to go with Jumbo Cupakes with Black Liners and a pink and champagne color scheme. I know how trendy! Pictures coming soon! Here at Bear Heart Baking Company we are all about the Tiered Wedding Cupakes! Not only are they unique, absolutely adorable, but trendy and fun, don’t forget affordable! If you are looking to go for a unique twist on a traditional wedding cake, why not try a tiered Cupcake Wedding? There are many options for stands and the best part is they are completely customizable and we are packed full of ideas if you are just completely stuck. York College Birthday Cake Delivery, York, PA Bakery! Here at Bear Heart Baking Company we are fortunate enough to live close to York College of Pennsylvania. So it is only fitting that we offer a York College Cake Delivery Service. It is actually one of our favorite things to do here at the Bakery. 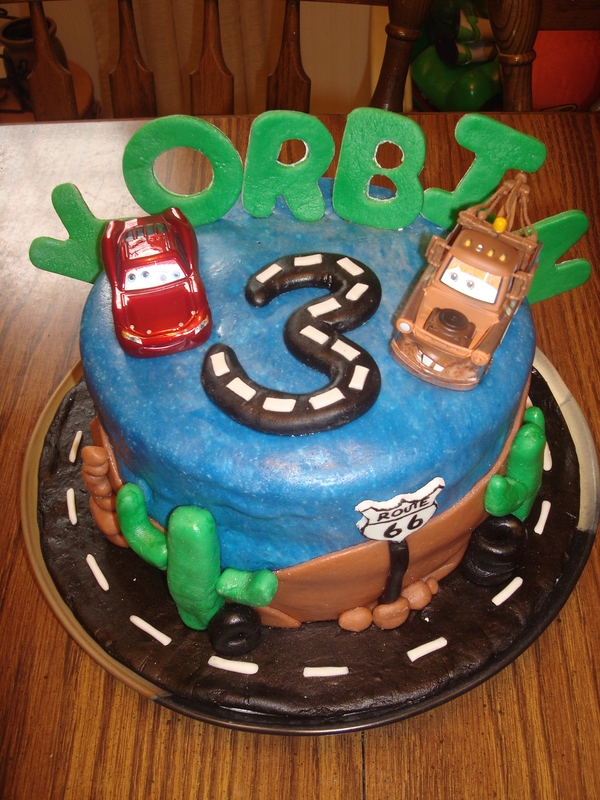 The cakes we create for each York College student is usually for a Birthday and incorporates something unique about the student. This particular Birthday Cake was for a student at York College of Pennsylvania and was for her 21st Birthday! We were so excited to share in her special day with her and her mother both! Desiree is really into Shopping, her Mother told me….particularly Gucci! Well we can relate I mean after all what girl doesn’t love Gucci? Ok, Ok so maybe everyone isn’t there biggest fan but Desiree sure is so she should definitely have a current miniature version of a Gucci purse on her cake, right? We thought so. While the purse didn’t say Gucci on it on their website we added it for anyone who wouldn’t know that it was a miniature replica of the white leather, bamboo handle purse featured for this Spring! Ok now I am starting to sound like an advertisement for Gucci, back to the cake! The mini Victoria’s Secret Shopping Bag and spilled Starbucks completes any shopping trip in my mind. It doesn’t hurt to throw in some new sunglasses from Coach to complete your Spring essentials kit. The little lipstick and mini credit cards were just the right touch to finalize it. The girly design of the flower made the cake look like a gorgeous Birthday Cake to begin with, however adding the little shopping touches personalized this cake as Desiree’s 21st Birthday Cake for sure! 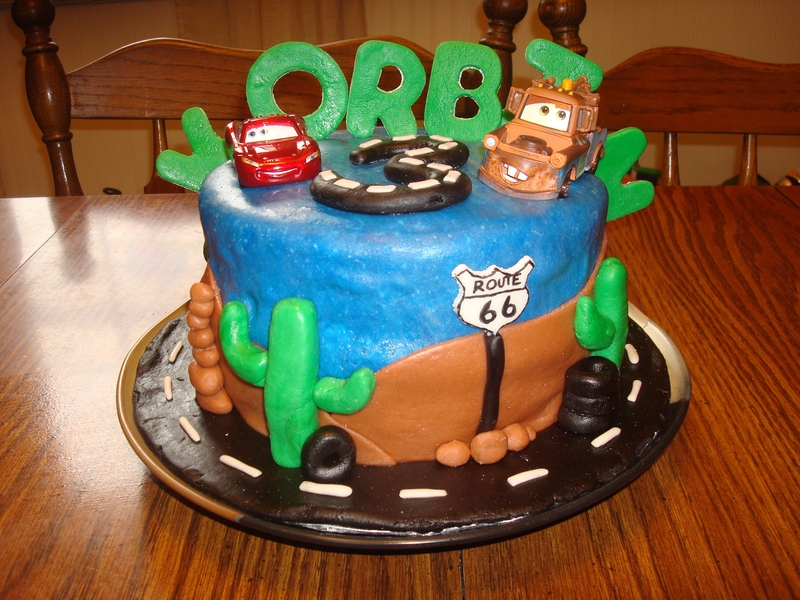 If you are interested in ordering a Birthday Cake for your student and having it delivered to York College of Pennsylvania visit our Contact Page for more info! Interested in Mailing your Child some Decorative Cake Pops for there Birthday while away at College? Not a problem, we Ship to anywhere in the U.S. and have shipped to many out of State Colleges! Sending Bear Heart Love to College Students all throughout the U.S.! !